My least favorite thing to do is wash a bunch of dinner dishes after a busy day at work! That’s why I was so excited to receive a copy of Camilla Saulsbury’s latest cookbook 200 Best Sheet Pan Meals. This fantastic cookbook is an excellent resource for busy cooks who love to cook simple, flavor meals. The recipes in this cookbook feature recipes that are cooked on a large rimmed baking sheet. It contains a wide range of recipes from appetizers and breakfast...and main dish entrees to desserts! A few of recipes that immediately caught my eye include Fresh Roasted Corn, Potato, and Fresh Mozzarella Salad; Garlic Salmon with Green Beans, and Sheet Pan Chocolate Chip Cookie Bars. I really had a hard time deciding on just one recipe to feature for this post, then I remembered that I had a package of boneless, skinless chicken thighs in my freezer. 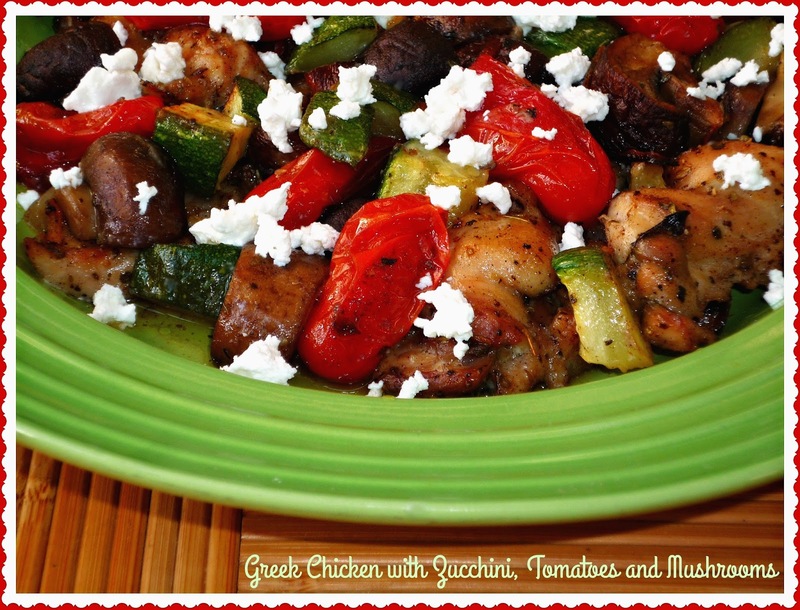 Greek Roasted Chicken with Zucchini, Tomatoes, and Mushrooms called for adding a few select veggies and seasonings to the chicken thighs to create a delicious one-pan dinner. This dish literally takes 10-15 minutes to prep, then it roasts in the oven for 30 minutes. 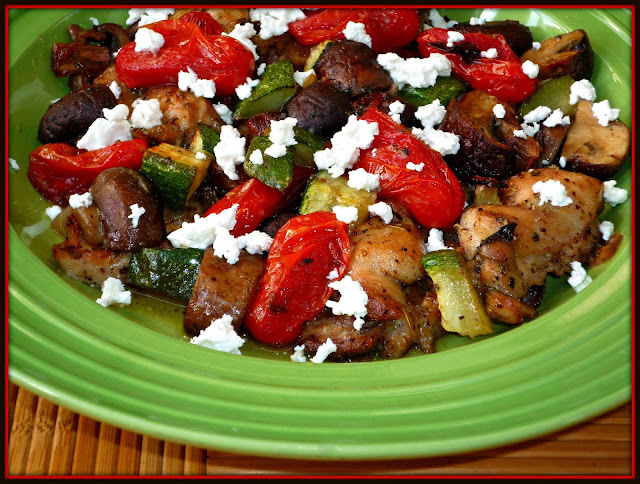 This gives you time to toast some pita bread or make a pot of rice to serve with this hearty dish. The only tweaks I made to the original recipe were to substitute sliced shallot for garlic cloves since I had that on hand…and to use some gorgeous little San Marzano tomatoes I found at the grocery store in place of grape tomatoes. Step 1: Preheat oven to 45o, and line a 18x13 rimmed baking sheet with aluminum foil. Spray with non-stick spray and set aside. 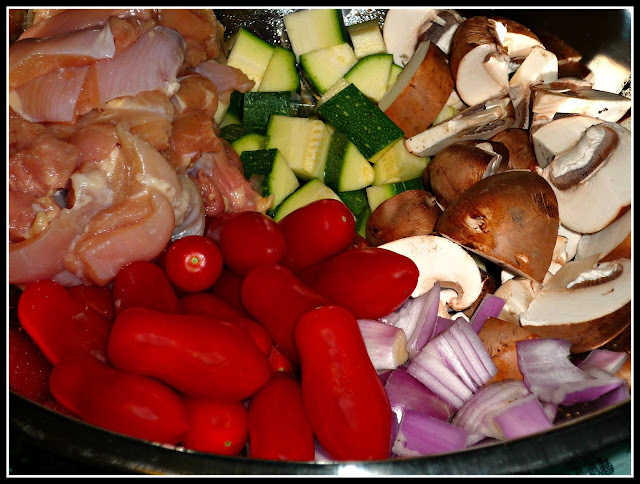 In a large mixing bowl, whisk together the olive oil, oregano, cinnamon, and salt & pepper to taste. Add the chicken, zucchini, mushrooms, and tomatoes. Stir well to completely combine and coat with the olive oil mixture. Step 2: Spread the ingredients in a single layer on the baking sheet. Roast in the preheated oven for 25-28 minutes, until the tomatoes are bursting and the zucchini is tender. The juices from the chicken should run clear when pierced. Sprinkle with the feta cheese and additional salt & pepper, if desired. Serve immediately. This simple one-pan dinner is jam-packed with complex flavors! Roasting brings out flavor and texture, along with the natural sweetness of veggies like tomatoes and shallots. The oregano and cinnamon provided great earthiness, and the feta brought a tangy punch of flavor. Dark-meat chicken thighs are a bit more fatty, allowing them to stand up perfectly to the roasting process. I absolutely loved this dish and can’t wait to add it to my weeknight dinner rotation. Even better? Because the baking pan was lined with foil, cleanup was a total breeze. 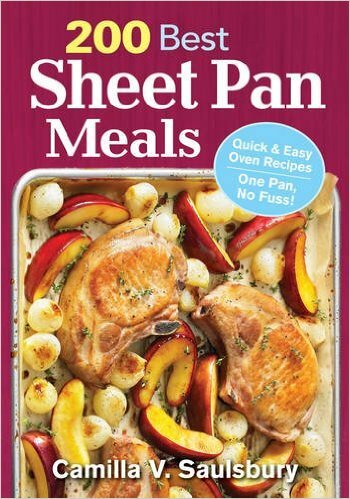 The 2oo Best Sheet Pan Meals cookbook is a really great addition to my cookbook collection that I know I'll use again and again. If you'd like a copy of your own, the cookbook can be purchased online via Robert Rose Publishing. Disclosure: Robert Rose Publishing provided me with a complimentary review copy of 200 Best Sheet Pan Meals to facilitate this post. All opinions expressed are solely my own.